When covering our holiday in Franconia, I figured it might be useful to start by explaining a little about Franconia, since it's an area few people really know much about. Most people, I think, know about Bavaria (Bayern in German); the southeasterly state of Germany, famous for wheat beer, Octoberfest, and so on. Franconia (Franken in German) is part of the state of Bavaria, but don't call a Franconian a Bavarian, as this is much like calling a Scotsman English. Franconia considers itself a separate region, and really is quite different from Bavaria, despite formally being part of the same state. The region consists of Nürnberg (500,000 inhabitants) plus some smaller cities (150,000 inhabitants down to 50,000), and outside the cities it's basically rural. 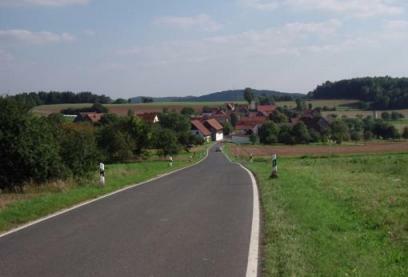 Franconia has lots of tiny villages, forest, farms, castles, small hills, little rivers, etc. A very nice area for bicycling and outdoor activities. The area between Bamberg, Bayreuth and Nürnberg is known as Franconian Switzerland (Fränkische Schweiz), and is especially nice. So, what is Franconia like? Well, it has a lot in common with Bavaria, including the wheat beer. However, in many respects it's much less cosmopolitan, and a bit of a forgotten corner of Germany, which means that it's retained much more of its Germanness. This is good for the tourist, since the less like the rest of the world it is, the more interesting it is. Somewhat suprisingly, perhaps, not all of Franconia is beer country. The northwestern area (known as Unterfranken, or Lower Franconia) is actually wine country, and best known for its white wines. The main city in this area is Würzburg, about which more later. The Germanness of the area has a number of consequences. One is that most people speak only German, and very little English. Most menus are also only in German, as are museum displays, etc. You can still get by with as an English-only speaker, but you lose out on a lot if you don't know any German. On the positive side most people are quite prepared to take the effort required to communicate with someone whose German is pretty rusty (like me), so you don't have to be fully fluent to be able to talk to people. Bratwürst with sauerkraut, bread, and (sometimes) horseradish, and other times French mustard. Soup with slices of pancake. Blaue Zipfel, which is basically blue bratwürst treated with vinegar and served in a kind of soup with onions. Sauerbraten, which is fried beef treated with vinegar, often served with a kind of potato dumpling. Spätzle, which is a kind of noodle. Personally, I like this kind of cooking quite a lot. However, after a couple of weeks on this type of fare you may find yourself hungering for a salad or some other lighter fare. Beware of ordering salad in Franconia, though. They don't seem to consider this food, and so don't really take it very seriously. Your best bet will be to find a modern-looking place, as these will usually have normal, international-type food. More traditional-looking places generally have equally traditional food. Any place advertising itself as having a "bürgerliches Küche" definitely falls in the latter category. There's a lot more than this to be said about Franconia, but I think I'll stop here for now, and deal with beer-related stuff (finally!) in the next instalment. Hi there I�m from Bamberg! As i was reading the article i saw the State Coat of Arms of Franconia, and i was ammazed to see the upper right part of it which consists of red and white, divided by three prongs arising from the white, which is the flag of Kingdom of Bahrain today, i would like to know the connection for this similarity !! Thanks for all of this great info it helped me loads when doing a project on Franconia!! Nice little article, there. I've lived in Kulmbach for 13 years now, come from NY originally. I wouldn't want to live any place else. Kulmbach is actually among most famous of the Frankonian Beertowns, but like you said there's a lot more than beer here. And, you usually have to order salad separatly. At traditional places, salads can be pretty lame at times, but generally quite acceptable. And, there are many, very many more modern restaurants here. Upper Frankonia is an important culinary corner of the country. The food can get to you after a few weeks but it's sure tasty and great value for shorter stints. Thanks for the writing. I found you via Intranets research on kveik, and as an Expat currently living in Franconia, had to read your thoughts on my environs. Rest assured, there are no decent salads here-your instincts are solid. 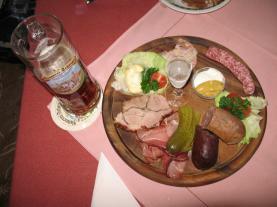 Food in Franconia is sadly like food in Germany, a thing of mere utility. There is no passion, drive, or anything approaching execution in this country's kitchen. And unfortunately, save for the execution, the same applies to beer here. If you're keen to know where I'm coming from, perhaps you'd like my own Blog, poorly-attended to though it is. If you're ever down these parts. shoot me a line. A few beers, of course, would be obligatory.